Is this thing still on? Here I go again with blog posts months apart. I've been terrible with the blog upkeep, but I have been active on Instagram and, more recently, YouTube! The latter, I'm pretty excited about, so I hope you check out my channel when you get the chance. But as I was not able to get any footage during my trip to Bangkok last January, here's a quick photo diary and narration of what went down, over half a year later. LOL, SORRY ABOUT THAT! I was in Bangkok in 2016 but was not able to go around much because I was there for only a day. So, I was excited to go back and spend a few days there with great company. We stayed in an AirBNB in Thanon Si Ayutthaya, which was down a little street. It's very accessible and close to the Phaya Thai station, however, it can be easy to miss if you don't look out for the signs. So one of the things I've learned while traveling is to take note or take photos of landmarks and signs that are around the place where I'm staying. This is because I may not be saying the name of the street correctly, so it comes in handy to have the photo which had the street sign written in Thai. I arrived in the evening and was exhausted from all the traveling, so we began the adventure the next day. And the first on the list of things to see was, of course, the temples! But before heading in the temple, we stopped for quick Thai lunch at a quaint, little restaurant right around the corner. I can't really tell you the name, but it's just across the temple gates. You will find a row of small restaurants surrounding the temple, so if you ever get hungry before or after your temple visit, it's easy to find a place to chill and recharge. When it came to which temples to visit while in Bangkok, we narrowed it down to the must-see ones -- the first being Wat Pho or Temple of the Reclining Buddha. Although I have seen the temples in Phuket last year, I still find them interesting and enjoy taking the time to explore each one. Wat Pho is beautiful. The walls inside where the Buddha is are hand-painted with patterns. Yes, you read that right: hand-painted! I noticed a lady working on them as we were walking through. Amazing! It was a huge lot, and we walked around a little bit more to see what else was there. After visiting Wat Pho, we decided to go ahead and see another temple - Wat Arun or Temple of Dawn. To get there, we had to take a water taxi across the Chao Phraya River. I read somewhere that the best view of the temple is to be seen from the east side of the river at sunset. 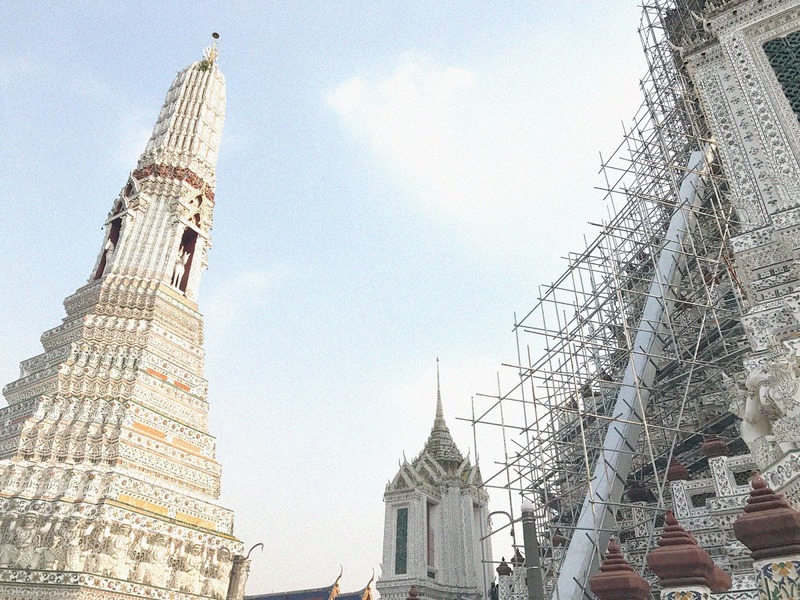 So if you plan to visit Wat Arun, this might be of useful information to your planning (and photo taking). During our visit, however, some construction was ongoing. I think they were renovating or doing some maintenance work as we saw parts of the area being painted/built. Overall, I enjoyed spending my day visiting these two temples and observing the sights along the way.